Length: 2 hrs. 47 min. Some heroes changed the world... for eternity. 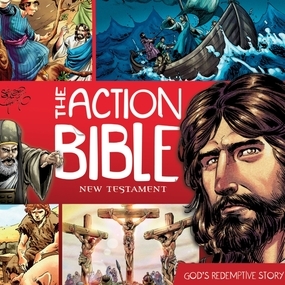 The heroes and stories of the Bible come to life in this New Testament edition of The Action Bible. Through dramatic reading and realistic sound effects, the events of Scripture explode in a powerful, exciting new way. Familiar characters turn into champions of faith, and often-heard tales become exciting stories of God’s power. And the New Testament’s big picture unfolds as each story is told in the order it happened, from the birth of Jesus to His resurrection and return. The storytelling makes the Bible’s message clear while capturing all the drama, impact, and truth of Scripture. Careful attention to biblical accuracy keeps things trustworthy. Just for today’s kids—and adults with a child’s heart of wonder—it’s the greatest story ever, brought to life in a whole new light.